Sometimes you’re better off being yourself and accepting who you are. This story is a hilarious example of just that. A 45 year old woman from Los Angeles had a heart attack and was immediately transported to the hospital. While she was in surgery she had a supernatural near death experience. After she recovered, the woman decided to live life to the fullest and make the most of the time that she had left. She decided to stay in hospital and do plastic surgery on her face, undergo liposuction, breast enlargement and abdominal fat removal. She also called a hair stylist to color her hair and an orthodontist to perform a ‘teeth lift’. She figured that if she had so much time in front of her, she should live the best way possible. 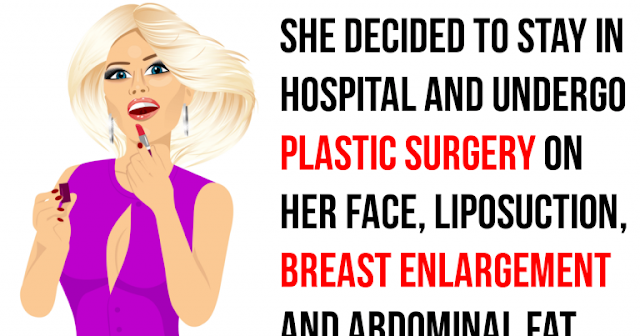 After her last plastic surgery, she put on a new dress with matching heels, left the hospital, went across the street and an BAM! An ambulance ran her over, and she died instantly. While crossing the gates to heaven, she reached God and demanded to know what happened.